Being one of the very few countries (two others are Poland and Israel) whose monetary policy managed to avoid a recession on the heels of the 2008-09 crisis, Australia is a natural object of Schadenfreude! 1 Is Australia Sliding Into Recession? 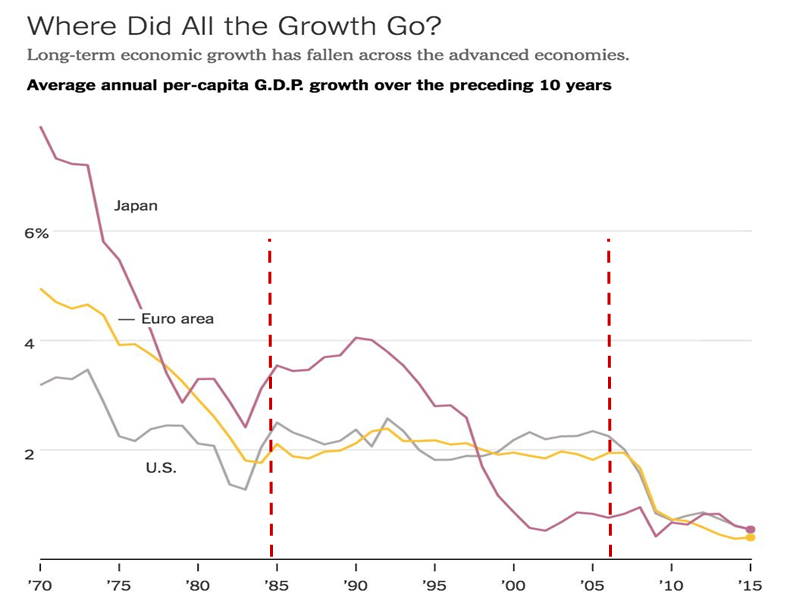 What if our economic growth stalls altogether? 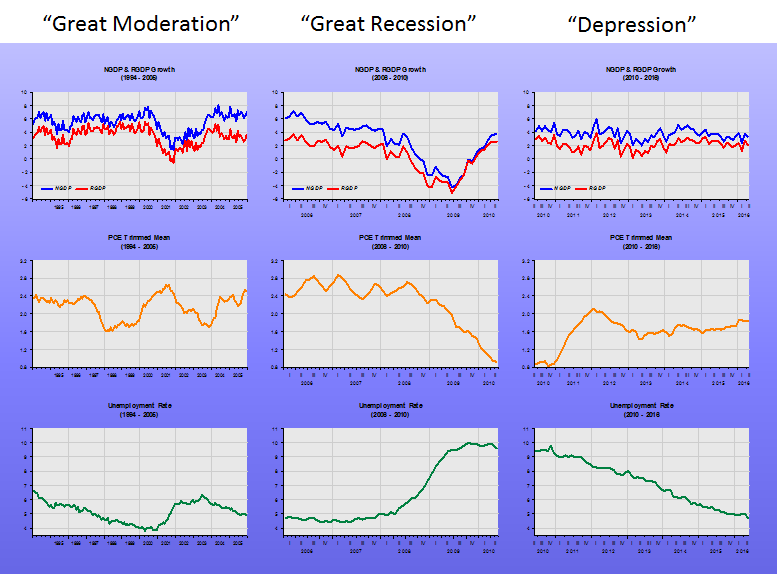 Worse still, what if we slip into recession? These are not farcical questions. Figures released this week recording just 0.2 per cent growth in Gross Domestic Product for the June quarter, and just 2 per cent for the year to June, were extremely weak. Indeed, without a one-off increase in government defence spending, the quarter would have recorded zero growth. There´s as usual some luck involved. In the case of Australia, it did no harm that immediately before the crisis hit, it was effecting an “excessively” expansionary monetary policy, as indicated by NGDP growth and it´s level relative to the trend path. 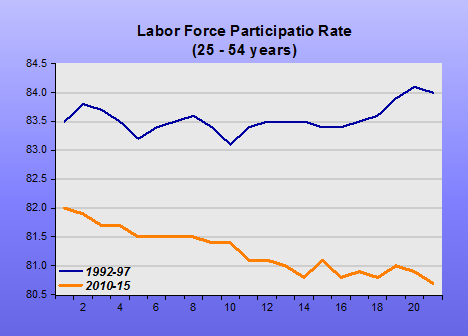 The two charts illustrate. Australia is the prototype commodity exporting country. In such cases, the exchange rate should move to offset commodity price or terms of trade changes. That´s what´s reflected in the next chart, with two notable exceptions. 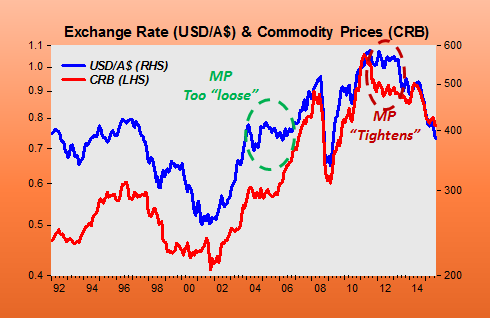 In 2004-07, the exchange rate doesn´t move, while commodity prices are rising. 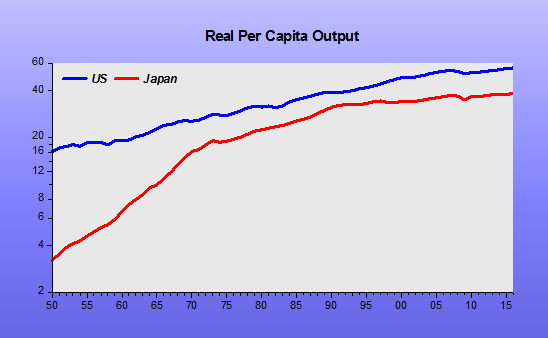 That boils down to an expansionary monetary policy. 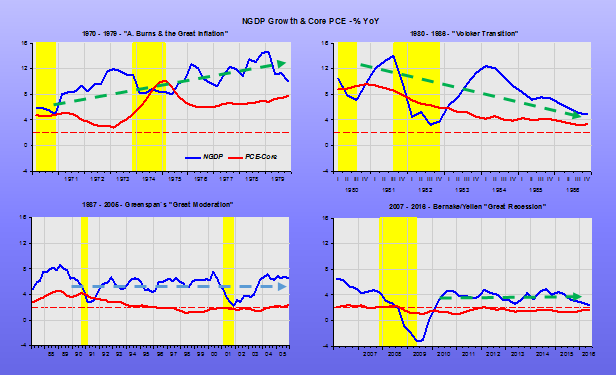 In the first set of charts that is reflected in the upward trend taken by NGP growth and the rise in NGDP above trend. In 2001-13, the RBA tightened policy. That is implied by the fact that falling commodity prices were not accompanied by a depreciation (fall) in the A$ relative to the dollar. 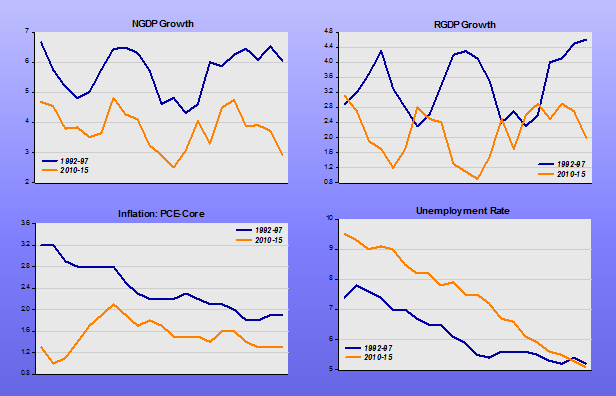 In the first set of charts, we observe a strong fall in NGDP growth. 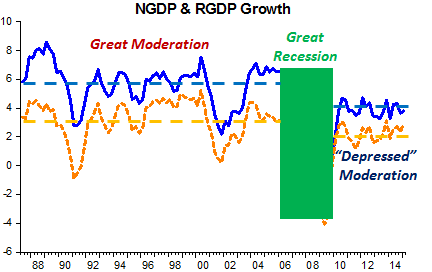 We note that NGDP growth has done a lot of “swinging” after the crisis hit. Scott Sumner thinks that the RBA has “chosen” a lower growth rate for NGDP. That may be right, and I put that new trend growth at 4%. If that´s correct, we may soon find Australian NGDP growth settling around that level, implying that NGDP will evolve close to a level path that will be below the previous one. There´s, however, always the risk that the RBA, if it starts worrying about debt levels and house prices, will make the mistake the Riksbank made in 2010. Let´s hope that doesn´t occur! 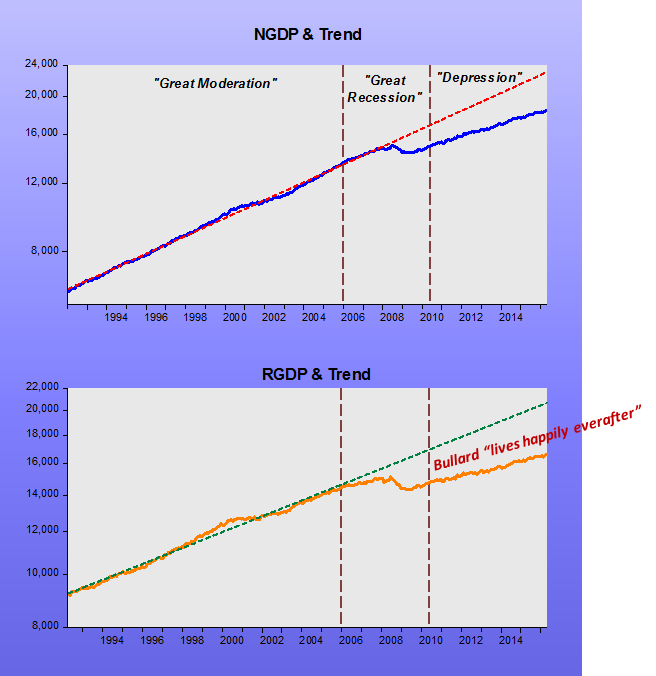 Update: In Australia, the post crisis “NGDP growth swings” are reminiscent of the “Volcker NGDP growth swings”. What Volcker was trying to do was find a stable path for NGDP. 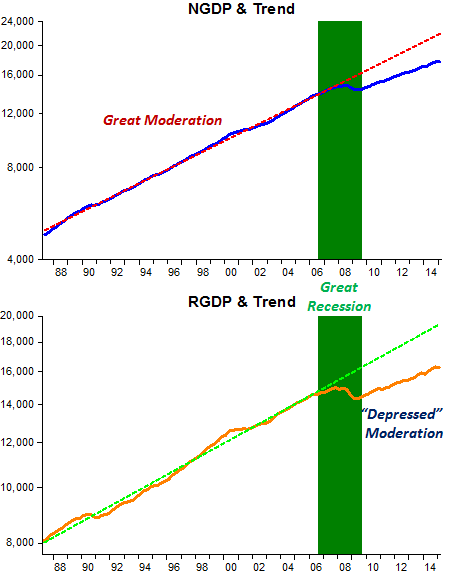 That was “bequeathed” to Greenspan, and the “Great Moderation” ensued, until Bernanke lost it!